Can India's cities escape their nasty parking spiral? More and more Indian cities see parking as a crisis. That could be a good thing! A crisis can open minds to alternatives that were unthinkable before. A typical news item this week gives a taste. It is from Patna but could be in any Indian city. PATNA: The parking lots available in the city are not enough to accommodate even 5% of the vehicles registered with the district transport office (DTO). ... commuters say they are forced to park vehicles on the roadside due to lack of sufficient parking space. Priyanka Kumari, a bank employee, argues, "Most of the time I park my vehicle on the roadside due to lack of parking lots. I have been fined twice, but what can I do? When the administration cannot provide parking space, what moral right does it have to impose fine on us?" ... The Patna Municipal Corporation (PMC) is working out plans to solve this problem. "We are thinking of constructing some multi-storied and underground parking lots in the city," said PMC commissioner Pankaj Kumar Pal. The current approach is not working. Obviously something has to change. But what? Parking prices are extremely low, if there is charging at all. Enforcement is weak and intermittent. The howls of protest in Patna above reflect dismay at being fined for parking as usual. Car and motorcycle ownership is rocketing upwards. Everyone says that there is a shortage of legitimate places to park near most centres of activity. The walking environment is uncomfortable (partly because of all the chaotic parking), so parking three or four hundred metres away is not considered an option by prosperous car owners. Despite the local shortages, there is little private investment in off-street parking. It is simply a terrible investment when the competition is cheap or free/illegal parking in streets so no-one is willing to pay much for parking, nor to walk far to reach it. So most Indian cities look to American suburban-style parking norms (the local name for minimum parking requirements). These force building developers to create enough parking regardless of returns. They are forced to cross-subsidize their parking from other business activities, which means customers who use no parking space at all are forced to pay for it too. If you think this is a good idea for dense cities, consider the results of 50 years of this for America's inner cities. However, there is dismay (and ruthless enforcement) when building owners 'flout the norms' and fail to put much actual parking in the required parking areas. Why would they do that? Motorists are not willing to pay much and anyway often shun off-street parking altogether. So keeping precious built space for parking can seem like a waste. Remember, these are dense cities with high land prices. So it must be very tempting to use the space for something else. India's cities are therefore also scrambling to promise to build off-street parking structures themselves. But the pricey land means this is only an option on existing city-owned land (never mind the opportunity cost!) or even under parks. But the costs are still too high when weighed against the low returns. City-owned facilities must therefore be heavily subsidized. With every such structure, well-to-do car owners get another regressive subsidy from cash strapped local governments. This is money that could be used for much much better things. So maybe it is a blessing that progress on building such structures is extremely slow. Perhaps failure will force a rethink on parking policy. How can India's cities escape this parking spiral? Low on-street prices and weak on-street enforcement are key sources of this nasty spiral. Doing better will require (at least) tackling these sources. There are signs that various activists and officials in Indian cities agree. Will action follow? Excellent post. 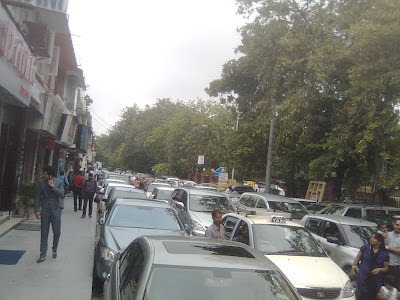 India's parking problems are similar to ones faced in Pakistani cities. One of the reasons is poor parking bye-laws. Currently, owners of commercial properties (including cinemas) must provide at least one parking space for every 500 feet of covered area. This is not enough. As a result is that commercial buildings never have enough parking. In steps the local government, which auctions the rights to collect parking fees in front of these buildings. What's happening is that building developers are not required to provide enough parking and the local government collects revenue from the auction to collect parking fees. Local governments, in fact, are raising revenue from inadequate parking bye laws. And the cost of all this is subsequently borne by the public in terms of parking fees and congestion. @Rafay Alam Thanks for your comment. But I can't agree that higher parking norms (= higher minimum parking requirements) are the answer. I know it seems like it is the obvious answer. I know almost every city in the world does it. But it is generally a mistake. 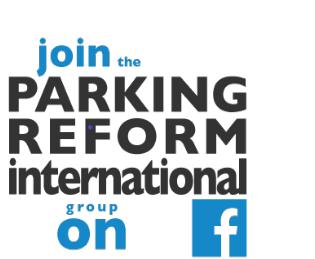 Look through the posts on this blog tagged 'minimum parking requirements' (http://www.reinventingparking.org/search/label/minimum%20parking%20requirements) and you will see various arguments AGAINST relying on parking norms to address parking problems. It is usually better to think of parking as something to get right for each local neighbourhood, not for every specific building site. The negative side effects of requiring every building site to have its own parking have been quite horrifying for American cities for example. By the way, 1 space per 500 square metres of built space sounds like a high requirement (especially when you consider how low car ownership is in Pakistan). If that is not enough, what would be enough? While discussing the problem of parking spaces, we forget the problem of public transport system available in these cities. We do not have comprehensive public transport system in place that can be used without getting dirty and wet with sweating and arriving to destination in bad shape. This forces people to look for private cars. Also, these cities have started developing only recently, that too without any planning. Parking in Lahore, Pakistan is Rs. 10 per car for the day (about US$ 0.10). Sugar is Rs. 60 per kilo. I can't understand why car owners get such a ... subsidy. You're right about the low car ownership per capita, but we are talking of people rich enough to afford cars!! There's some research that's been done in New Delhi about the amount of real estate consumed by parked cars each day. The value of the use of the real estate was quantified and it was argued that the parking fees charged do not in any way represent the true value of the use of the real estate by parked cars. I also agree with the notion that parking requirements should be determined with the neighborhood and not just the specific building in mind.